First, this is a really easy recipe: Mix the dough, let it sit, shape it, let it sit, bake it. That’s all there is to it. I’ve been rather specific in some techniques that I found helpful, but don’t let all that put you off. This really is a great, flexible, and easy recipe. Second, I usually don’t mention hardware but, in this recipe, they make a difference. The one crucial item is the Dutch oven. You can replace cast iron with enameled iron or heavy anodized aluminum, but it must be heavy and seasoned and it must (must) have a cover. Cooking it covered traps the steam and gives you a nice, chewy crust. Measure flour, yeast, and salt into a 2 quart bowl. Add water and mix together with a wooden spoon. Dough will be rather wet and sticky. Cover tightly with plastic wrap (I use a rubber band around the rim. Set bowl in a warm, quiet place for 14-18 hours. Dough will have lots of little bubbles at the top and may have sunk down a bit; do not worry, this is fine. Remove the plastic wrap. Using small sharp strokes with the edge of the rubber spatula, gently scrape the dough out onto a well-floured board. Try to disturb the dough as little as possible. Using the dough scraper, fold the dough over on itself once or twice (but no more). Dust the dough with flour and gently shape it into a ball. Then, with floured hands, pick it up and gently roll it a little inside out, stretching the top and tucking the sides in under the bottom. Put it back down on the floured board. Line a bowl or basket with parchment paper. Dust the inside with a little flour and/or corn meal. Then nestle the ball of dough into the lined bowl. Put dough back in the warm place for 2 hours. Put the Dutch oven into the oven and preheat to 450°F for 30 minutes. Lift the parchment paper and the dough out of its bowl and put it on a board. Gently separate the paper from the sides of the dough ball. Using the dough scraper, separate the bottom from the paper around the edges. 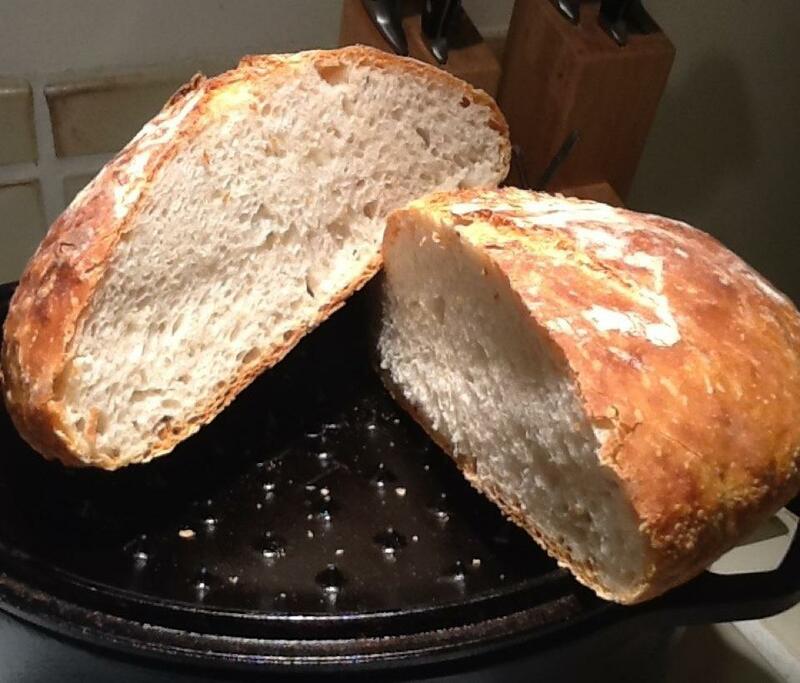 Take out the hot Dutch oven, remove the top, and (as gently as possible) put the dough top down into the Dutch oven. Finish removing the parchment paper. Cover the Dutch oven and pop back into the oven. Cook covered for 35 minutes. Take the cover off and cook for another 10 minutes. Play around with the amount of water. A tablespoon one way or the other makes a big difference, but stay within 1 ¼ and 1 ½ cups. The higher water content gives big, artisanal bubbles and a stretchy, gluten-y texture; less water makes for a finer, more even loaf, and generally holds a better height to the final rise. For a crisper crust, brush the crust with olive oil during the uncovered cook time. I’ve been making this bread for years. It has totally changed my life.